This collection has four different themes with approximately 18 designs in each theme. Most of the large designs are applique, so the stitch counts aren't as high as you may think. 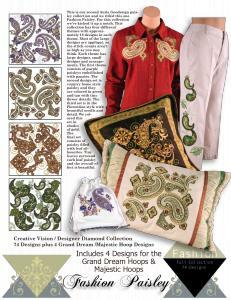 The paisley designs look great on both clothing and on home decor items. The first theme consists of purple paisleys embellished with pansies. The second design set is country home style paisley and they are colored in green and tan with tiny flower details. The third set is in the Florentine style with beautiful scrolls. We colored this set in shades of gold. The final set consists of paisley filled with leaf silhouettes. Tiny leaves surround each leaf paisley and the overall effect is beautiful.